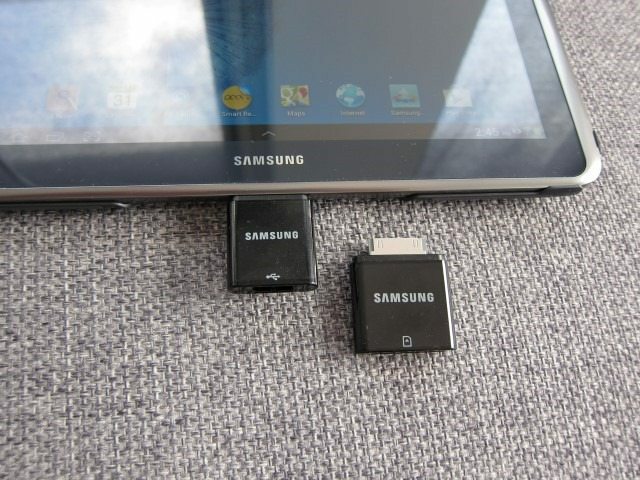 Tablets and USB ports usually don’t go well together: adding a USB port to a tablet typically means a chunkier tablet. 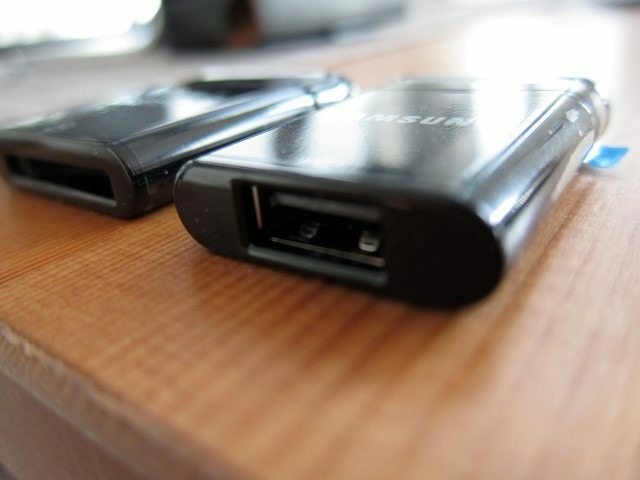 Manufacturers like Asus have found ways around this problem by going the battery-and-keyboard route which many times also has one or two USB ports tucked to the sides. But what if you want USB on the cheap? 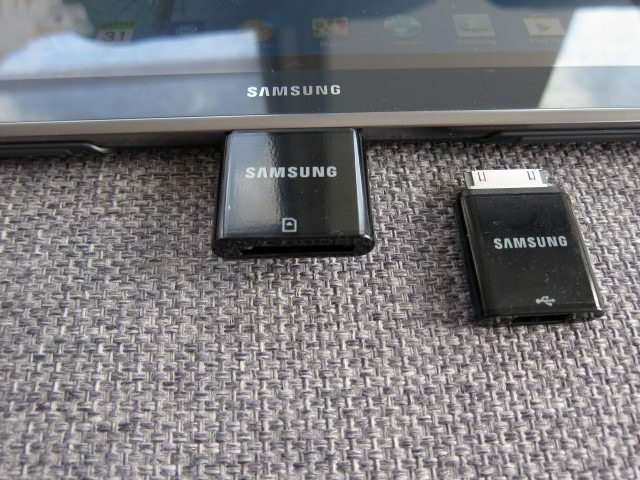 If you own a Galaxy Tab or Note tablet, Samsung’s USB Connection Kit just might do the trick with a few surprises up its sleeves. 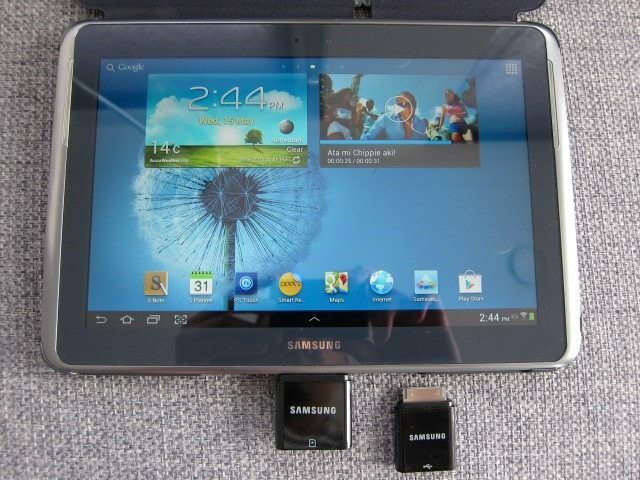 The Samsung Galaxy Tab USB Connection Kit (EPL-1PLRBEGSTD/A) is obviously designed for the Galaxy Tab but what is not advertised is that it also works with the Galaxy Note 10.1 tablets. 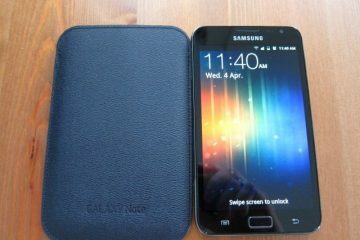 Armed with a Note 10.1, I decided to see how well the two would work together. 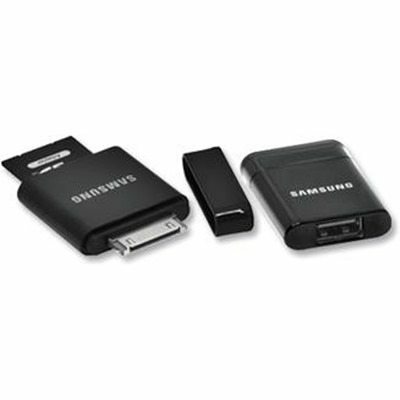 The package consists of not one, but two accessories: a USB adapter and an SD card adapter. The latter many times is a surprise to those buying the kit, thinking that it only offers USB functionality, which is a nice surprise. 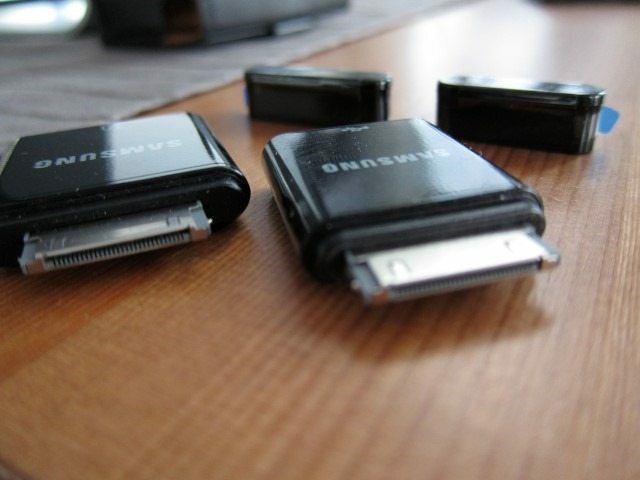 The adapter turns your tablet into a host, allowing you to connect USB accessories such as keyboards, mice and thumb drives, while the SD adapter leaves no surprises here: it adds an SD card reader. It’s clear Samsung favored portability by splitting the functionality over two accessories, instead of cramming it all together into of those 4-in-1 connection kits. While those kits offer more connections and the convenience of having an all-in-one solution, they’re much bulkier. With the functionality spread across these two devices, they’re easier to carry, about the size of USB stick, but slightly wider. 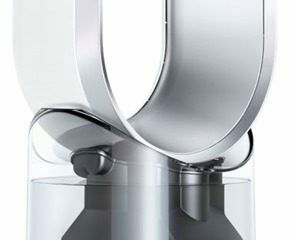 There are two very important facts you should know about the kit which might make or break the decision in getting one. In the first place, both accessories only work with FAT32 formatted devices, which is an Android limitation and not the accessories. If your devices use NTFS or exFAT, they won’t work unless you’ve rooted your devices and have added this functionality by following the many workarounds available on the net. This can also easily be resolved by formatting your media to FAT32 in order to get it to communicate with the tablet, which also brings us to the second issue: files can be a maximum of 4GB which can be a problem for those that often use large video files. While the manual reports a maximum supported storage of 32GBs, it should easily work with devices with a higher capacity, as long as you use FAT32. Your mileage will vary, but having the latest software update will get you a long way. With a price of about the 22 to 39 Dollars (or Euros) the kit definitely costs a lot more than the 4-in-1 kits or a separate USB OTG cable. With the 4-in-1 kits going anywhere from the 6 tot 19 Dollars ( or Euros) and a USB OTG cable costing less than 10 Dollars (Euros) it’s clear that many will be going with these cheaper solutions. If you don’t need SD card, a cheap USB OTG cable is the way to go. What you do get for the price premium is Samsung quality, fit and finish and a much smaller and more refined solution that’s also much easier to carry. The two accessories have exactly the same design, although the SD reader is slightly wider: All-Black, glossy and very small. 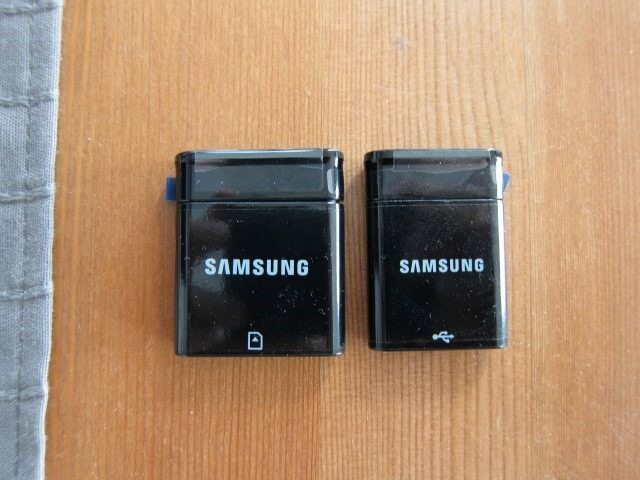 Both are similar in size to a USB stick, but a bit wider and very light in weigh. 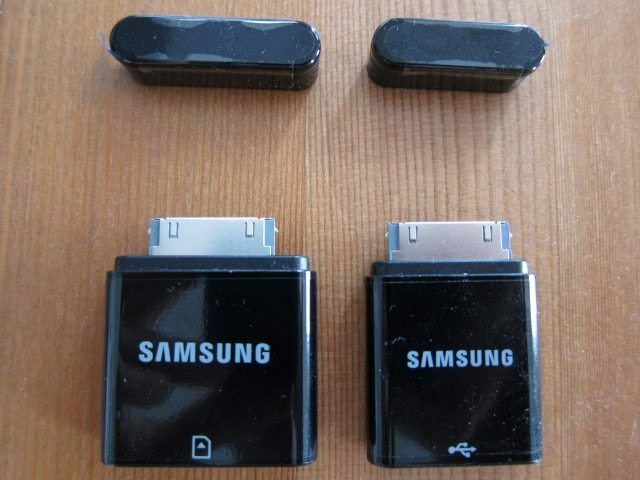 On the front we find the White Samsung logo on both adapters, while one has the USB and the other the SD card logo. 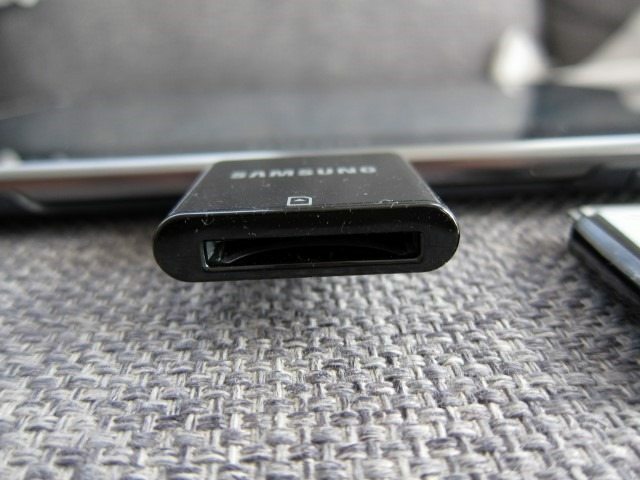 Each adapter has a removable cap that covers Samsung’s proprietary 30 pin connector, while the USB and SD card connections lack a cover. That pretty much covers the design side of things, as these accessories are pretty simple. As stated earlier they are very small and light in weight, kind of like taking two thick SD cards with you. With both of them in my jeans pocket I simply forgot they were there. Using the accessories is pretty simple, except for one small fact. The manual clearly states that it’s necessary to connect your USB device or SD card to the adapter before connecting them to the tablet, otherwise “your mobile tablet might be damaged.” This is mentioned in a piece of text hidden in the tiny manual which many simply won’t even read and I’m pretty sure many will simply connect the adapter first to the tablet and then connect the SD card or USB device. This is a bit counterintuitive and something that can potentially damage your tablet. Other than this both accessories work as advertised. Once my FAT32 formatted devices were connected, the tablet recognized the storage device and immediately launched Samsung’s file manager called “My Files.” After this I was able to easily move files to and from the external media. There’s even an option to “Select to remove USB mass storage safely.” As expected, high power external hard drives that require extra power won’t work, unless they have some power outlet. Even so, chances are it won’t as most external drives are NTFS formatted, which Android doesn’t support. If you need more USB ports, a USB port replicator will also work, even though it isn’t the most elegant solution. The same applies for SD cards, which also works just as great, making it ideal for photographers that don’t have a network connected camera and want to quickly upload pictures. For now the SD card adapter is handy, but in the long run, as cameras start to get built-in Wi-Fi, it will become irrelevant. What I truly liked was the ability to connect my mouse’s receiver to the USB adapter and control my tablet with a mouse! Adding my Bluetooth keyboard and I had a mini laptop. It should also work with some printers, but didn’t test this that feature. Because the adapters sticks out quite a bit, you won’t be able to position your tablet vertically with the many cases that are able to do this. You’ll either have to lay it flat, use one of the accessories or case that slightly angle it up or use Samsung’s own keyboard dock, which basically put the 30 pin connector to the side. 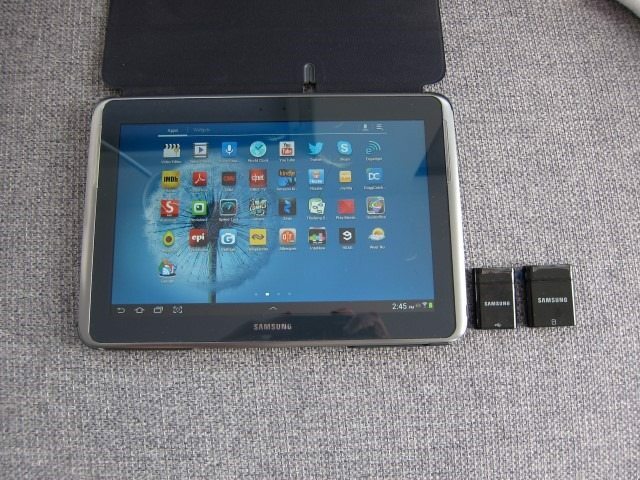 The Samsung Galaxy Tab USB Connection Kit is a handy accessory for the Galaxy Tab, but also works great with the Note tablets, adding an SD card reader and even a full-size USB port. 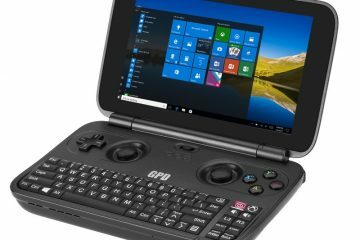 This basically turns the tablet into a mini PC for a relatively low price. With a price of about the 22 to 39 Dollars (or Euros) the kit definitely costs a lot more than the 4-in-1 kits or a separate USB OTG cable. If you don’t need SD card, a cheap USB OTG cable is the way to go. What you do get for the price premium is Samsung quality, fit and finish and a much smaller and more refined solution that’s also much easier to carry. There are two very important facts you should know about the kit which might make or break the decision in getting one: both accessories only work with FAT32 formatted devices and files can only be a maximum of 4GB which can be a problem for those that often use large video files. Because the adapters sticks out quite a bit, you won’t be able to position your tablet vertically with the many cases that are able to do this. You’ll either have to lay it flat, use one of the accessories or case that slightly angle it up or use Samsung’s own keyboard dock, which basically put the 30 pin connector to the side. The kit is consists of two useful little accessories and gets a 8.5 out of 10.